It's not often you get a giveaway as handy as HP's Smart Web Printing--a browser plugin that helps you cut down on paper waste by allowing you to grab only the portions of Web pages you want and consolidate them into a single printed document. And despite what the name might make you think, it works on any printer, not just HP's own. Smart Web Printing's interface is simple and can be tucked out of the way when not in use. If you were to read about Smart Web Printing online at HP's site, you might get the idea that it works only in Microsoft Internet Explorer. That's true; however, this might also lead you to believe that it doesn't install in Mozilla Firefox. It does install. It's simply not compatible with the current version, Firefox 3.6.12. HP says it will again support the latest version of Firefox by Spring 2011. Using Smart Web Printing is easy. Once you invoke it, a vertical pane appears on the right-hand side of the browser window. Click the Select button and you can lasso areas in the main browser window. A context menu pops up upon selection that allows you to either print the selection immediately, or add it to the program's clipboard for editing, saving as PDF, or printing later. Smart Web Printing's clipboard captures items as images only, so you'll need OCR software such as ABBYY FineReader 10 if you want to extract text from it. If you're looking to capture text only, cutting and pasting into a text editor is a better method. The clipboard lets you resize clippings, and you can change the order they print in (as part of a single document) but otherwise the program handles the layout for you. 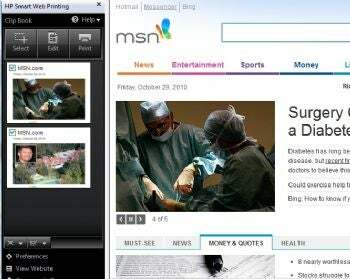 Although I wish it worked in the latest version of Firefox, HP's Smart Web Printing can save a lot of paper and ink. It's a must-have for anyone who ever prints or collects info from a Web browser.